Hampden Academy senior Marc Hutchings (center), pictured playing for Bangor High School in 2017. 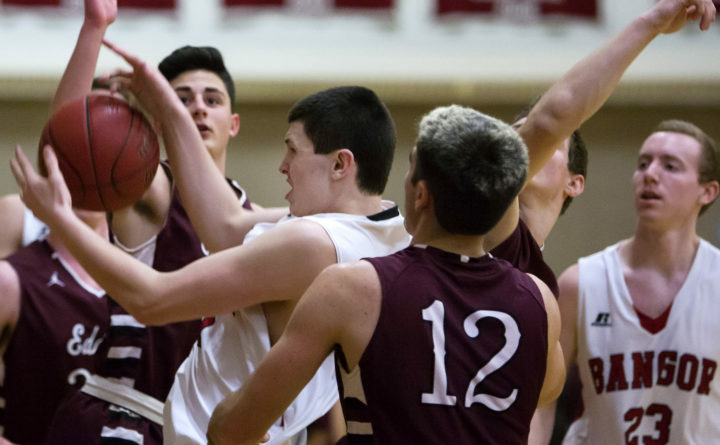 The starting center on Hampden Academy’s basketball team was hospitalized with serious injuries after his car went off outer Essex Street in Bangor and brought down a utility pole early Wednesday morning. Marc Hutchings, 18, is currently in the Intensive Care Unit at Northern Light Eastern Maine Medical Center, according to his basketball coach, Russell Bartlett. The Hampden Academy senior broke his pelvis, clavicle and multiple ribs in the crash, Bartlett said. At the time of his accident, about 3 a.m. Wednesday, Hutchings had been sent out to do sanding work by the property management company he works for, Bartlett said. His pickup truck slipped on ice, causing him to hit the utility pole near the intersection of Essex Street and Fox Hollow. Emera Maine sent crews to complete work on the fallen utility pole and resolve power disruptions Wednesday morning, according to a tweet from the official City of Bangor Twitter account. Hutchings has been playing well all year for Hampden Academy, according to Bartlett, whose team has a 7-1 record this season and is the defending Class A North champion. “He’s a hard working kid, comes from a great family, really humble,” the coach said. Hutchings played middle-school basketball in Glenburn, then attended Bangor High School as a freshman and sophomore and played on the Rams’ varsity basketball team before transferring to Hampden Academy for the start of the 2017-2018 academic year. Hutchings was a reserve for the Broncos’ basketball team as a junior and moved into the starting lineup this season. In his most recent game on Tuesday night, Hutchings scored 16 points to help Hampden defeat Messalonskee of Oakland 77-49.